ITV has scrapped its plans to hold a Brexit debate between Theresa May and Jeremy Corbyn this Sunday.The channel said it had invited both parties to appear on the programme two days ahead of the meaningful vote on Mrs May's withdrawal agreement.But an ITV spokeswoman has now said it will "not go ahead". On Tuesday, the BBC dropped its plan for a debate show featuring the pair the same evening.The party leaders had disagreed over their preferred format and channel.Channel 4 has announced it will hold a debate on Sunday featuring neither Mrs May or Mr Corbyn, but "four high profile politicians" - one backing the PM's deal, one behind a softer Brexit, one for a harder Brexit and one supporting the People's Vote. It has not confirmed who the politicians will be. The prime minster challenged the Labour leader to a televised debate last week after she started a campaign to encourage MPs to back her Brexit deal in a Commons vote on Tuesday 11 December. Mr Corbyn accepted the challenge, but a row ensued between the parties regarding the format. Mrs May accepted the offer of the BBC, who had wanted to include "a range of voices" in the programme, including members of other political parties, as well as a head-to-head between the leaders.But Labour said the proposed format was a "mish-mash, with a lopsided panel of other politicians and public figures" taking part.The party instead favoured ITV's offer of a straight head-to-head debate - but this offer has now been withdrawn. A spokeswoman for the channel said: "ITV invited the prime minister and leader of the opposition to appear in an ITV programme this Sunday evening, and we have been clear that it is up to those invited to decide whether they want to accept the invitation. "ITV is developing its plans for covering the build up and reaction to the crucial Commons vote next Tuesday, and a range of voices and opinions will be represented on the subject of Brexit in our output." 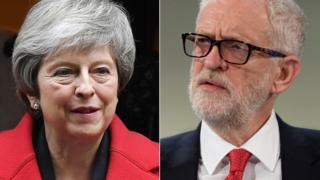 Labour has blamed the cancellation on Mrs May "running scared" of debating Mr Corbyn, saying he would "relish the opportunity to debate her - and that remains the case".A spokesman said: "Labour believed the head-to-head offer from ITV was the most straightforward format. "A head-to-head would give viewers the greatest clarity and allow both speakers to get into detail.He added: "The prime minister has refused to join Jeremy in a head-to-head debate. Her team tried to confuse people with a convoluted format. "But the British public will see this for what it is - Theresa May unable to face real scrutiny over her crumbling deal. "The BBC has contacted Downing Street for comment but has not yet received a response. ITV's political editor, Robert Peston, appeared to take a swipe at Mrs May on Twitter. The news comes as a senior Tory suggested Tuesday's vote on the deal could be delayed. 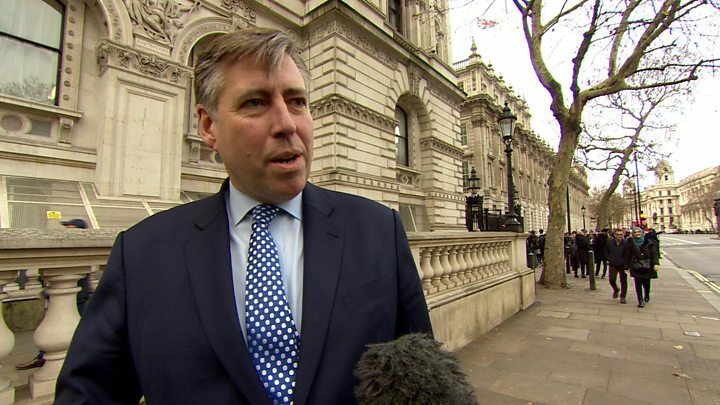 Sir Graham Brady - who chairs the party's backbench group, the 1922 committee - told BBC's Newsnight that the House needed "clairty" on the deal, and if that did not come in the next few days, he would "welcome the vote being deferred".Earlier, there were reports that members of Theresa May's cabinet were encouraging her to put back the vote, which she is expected to lose. Dozens of Tory MPs are expected to reject it, as are the DUP MPs, whose support keeps Mrs May's government in power.But a No 10 spokesman dismissed the reports, saying: "The vote will take place on Tuesday as planned." Many of the criticisms focus on the inclusion of a Northern Irish "backstop" in the deal - designed to stop the return of a physical border on the island of Ireland.It would mean Northern Ireland staying aligned to some EU rules, which many MPs say is unacceptable. The UK would also not be able to leave the backstop without EU agreement.